Chandigarh : A middle aged deaf and dumb women re-united with her family after 15 days. On the night of 28th August she was found wandering on Madhya Marg by the Chandigarh police and lodged in One Stop Centre “Sakhi”in Sector 26. 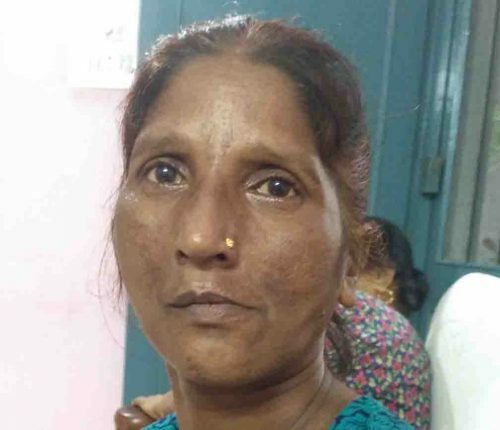 She was not carrying any identity document nor she could explain through gestures which could help in locating her origin.Then Sakhi centre contacted UIDAI, Regional Centre, Chandigarh for making Adhaar Card which is mandatory for inmates of all rescue homes.They took her finger prints. On 6th September, she was transferred to Swadhar Greh ( A Scheme of Ministry of women and child development ),sector 43,which was known as short stay home “Savera”till 2016,for her rehabilitation. Swadhar Greh tried its best to locate her antecedents and took help of labourers from Bihar and U.P. as she did not appeared belonging to this region. However nobody could help or understand her gestures . She was inconsolable and kept crying remembering for her children. She was pressing the staff to let her go. She even made attempts to escape which were prevented by the Staff and inmates. Then UDAI Centre was contacted to inmate the particulars if her Adhaar Card was previously made. It was informed that it will take about a week. On 10-10-2018 Adhaar Centre informed that Adhaar card of Manju has already been made . She is a resident of ward No-3,Chak Jogiwala ,Chidderwala ,Distt Dehradun,Uttrakhand. Her name is Manju Devi,aged 52 years and her husband’s name is Nepal. We searched on internet for police chowki Chidderwala who wanted us to contact police of Chak Joggiwala to get mobile no of Sarpanch of Ward no 3.The Sarpanch told us that he knew Nepal and Manju Devi. Immediately he went to her home but Nepal had gone to his in-laws village to know where about of Manju who had gone there on the occasion of Raksha Bandan. Her missing report had also been filed with the police of Chidderwala. However her son was at home. Then on our request the Sarpanch provided what’s app video call with her son, who recognised his mother and Manju also recognised her son. Both were delighted to see each other. Thereafter phone calls were received from Manju’s other members of family expressing their gratitude for ensuring her safety and making vigorous efforts to unite her with family. They told that Manju used to visit her parents’ home alone. This is the first time she was lost. They intended to reach Chandigarh in the morning of September 11, with their Adhaar Cards for purpose of identification.However, they reached this shelter home at midnight. Considering their passionate appeal and anxiety, they were allowed to take her home. We have already solved similar case where girls were reunited with their families with co-operation of UIDAI, Regional Centre.